At the National Prayer Breakfast, students that made up the leadership of their schools and those that are registered for the highest number of CXC subjects were guests of Territorial Representative and Minister for Education, Culture and Youth Affairs, Hon Myron V. Walwyn. 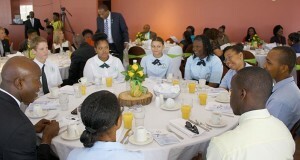 Road Town, Tortola – May 2 – This morning nine senior high school students from across the Territory had the opportunity to attend the Seventh National Prayer Breakfast as guests of Territorial Representative and Minister for Education, Culture and Youth Affairs, Hon Myron V. Walwyn. Paul Oliver and Jada Maduro, the Head Boy and Girl respectively of St Georges Secondary, Christie Latchman, the Student Body President of Elmore Stoutt High and Melvin Knight of Seventh Day Adventist Secondary make up their schools’ student leadership. Also in attendance were students with the highest registered CXC subjects; Kayliqua Baptitste, Demitri Browne, Jilian Jeffers, Johanna Marrugo and Rafael Savory. All five of those students attend the Elmore Stoutt High School. As it is now required that senior students sit the regional exams, those five students embraced the challenge and will be taking 11 subjects each. While at breakfast students commented that they enjoyed the morning’s proceedings and that they were all thankful for the opportunity. They heard from guest speaker, former South Carolina Governor, David Beasley, as well as received commendations and well wishes from members in the community on their academic and civic undertakings. He explained that Youth for Walwyn provided a list of issues facing young people in the Territory, and before they went out to advocate for him, they asked for his plans to address raised issues. “One of the issues they felt strongly about was their maturation so that they can properly manage the responsibility of advancing the Territory for all. Hon Walwyn extended thanks and appreciation to Territorial Representative and Minister for Health and Social Development, Hon Ronnie W. Skelton, for sharing his invitations so that more students were able to attend this morning’s breakfast.